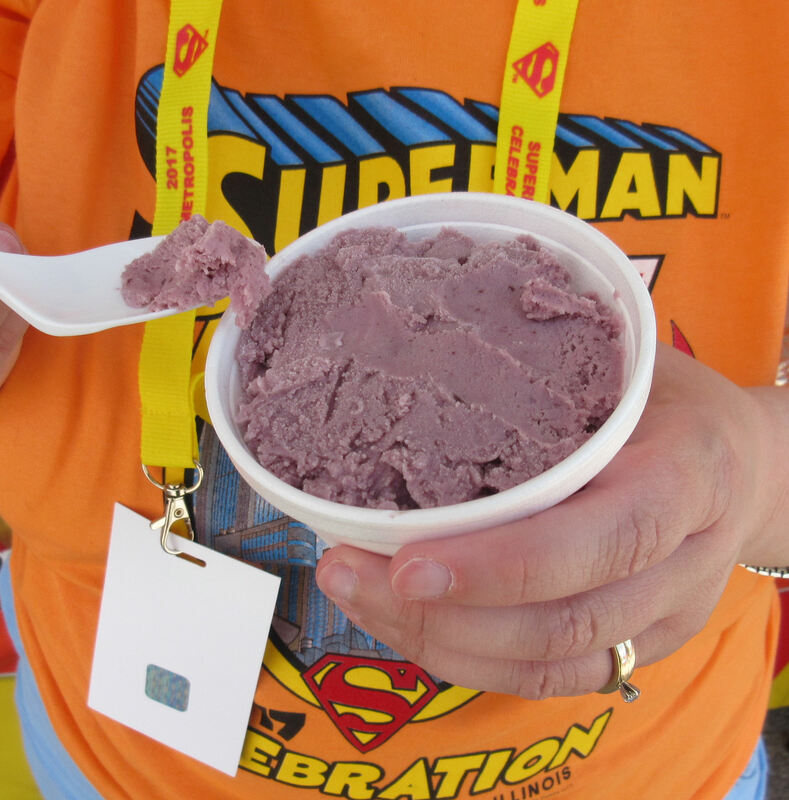 Superman Celebration 2017 Photos, Part 3 of 4: Festival Food! « Midlife Crisis Crossover! You’ll note in our lead photo Anne prefers variations on traditional fare, not that there’s anything wrong with that. Lemon Shake-Ups are her go-to carnival drink of choice, and remained in ample supply on these grounds. 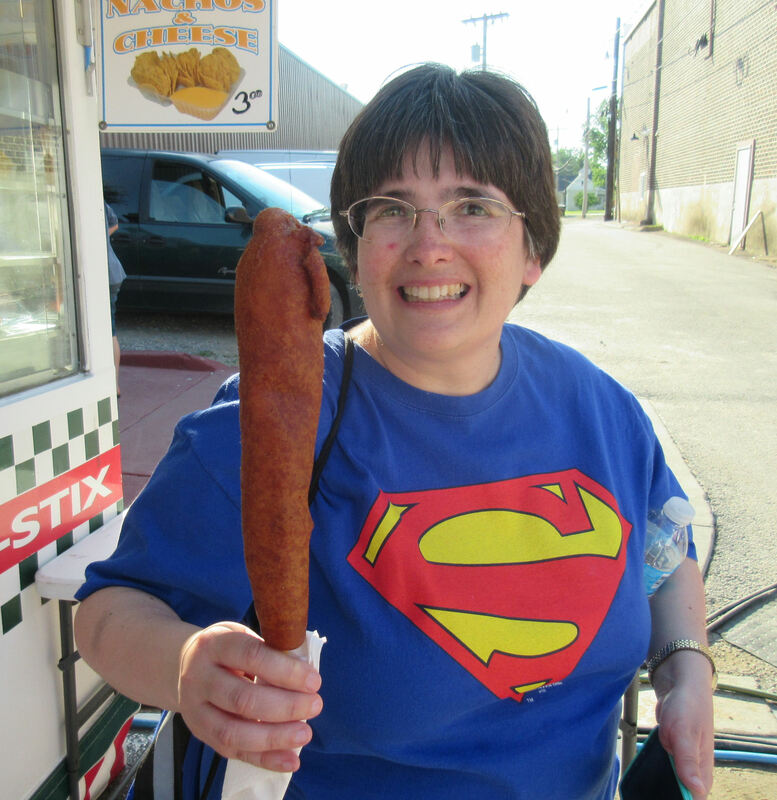 Tenderloins rank high on her all-time food-fave list, but this time she showed a modicum of self-restraint and settled instead for a jumbo corn dog, which by the vendor’s description weighed at least a pound less than their tenderloin did. Anne was also overjoyed to find a booth selling homemade blackberry ice cream, a rarity in most grocers’ freezers. We’re each getting to that age where we find ourselves increasingly curious about snacks that aren’t composed of 90% sugar and quasi-sugar byproducts, though I realize our other photos seem to belie that statement. For her the sharp blackberry tang hit the not-sweet spot just right. 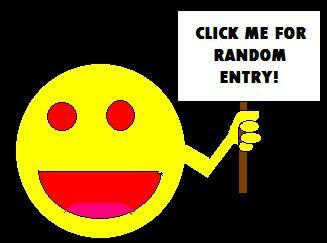 I must confess one item was partly a letdown. 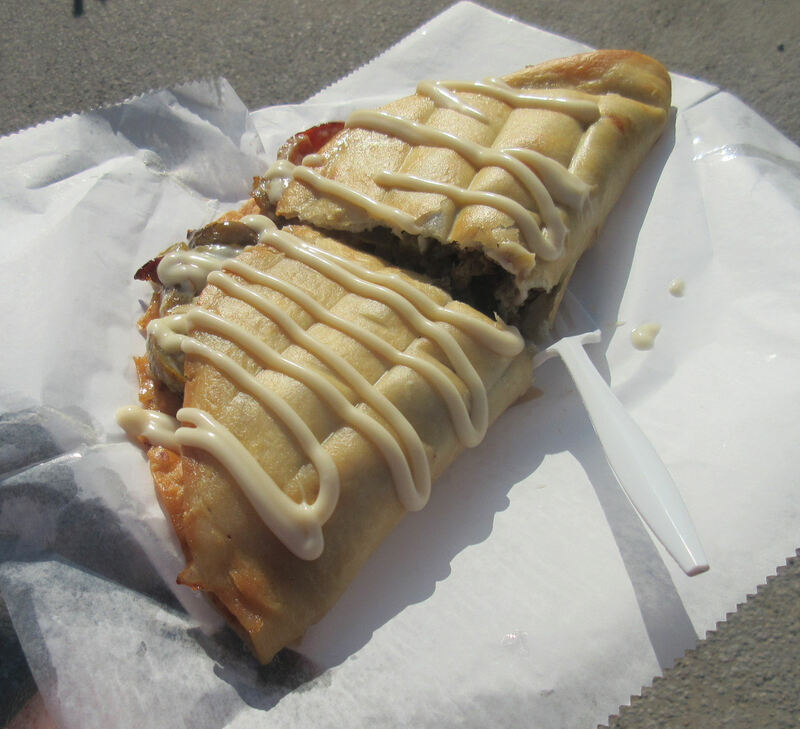 The largest meal I ate by far was a deep-fried Philly cheesesteak taco. Usually when a dish employs multiple adjectives you’re on your way to big bites of bliss, right? The filling of shredded beef, onions and peppers survived the process with flavors intact. The cheese sauce on top was a nice touch and added points for presentation. The shell resembled a Taco Bell Gordita but was the size of a pancake. The top half had that great texture and aroma that come from the finest frying, but all that grease sank downward and permeated the bottom half, rendering it soggy and impossible to pick up. I scraped away the filling to eat with just the top half, and abandoned the wasted bottom half. A much simpler but more successful use of protein was the Snuggle Dog. It’s like a pig in a blanket, but giant-sized. 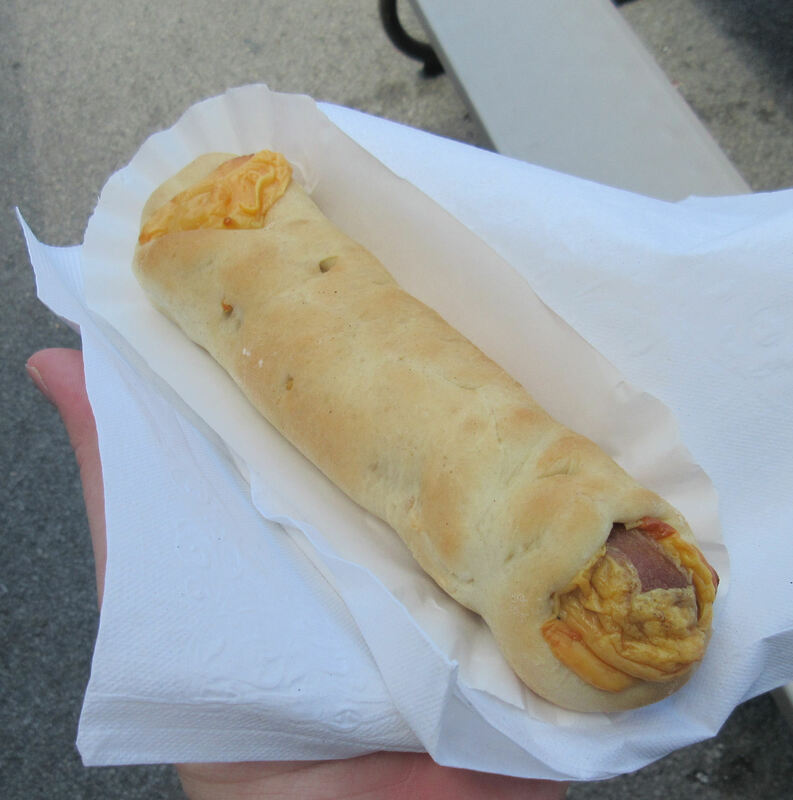 Take one jumbo hot dog; wrap it in cheese; cover it all in professional bread dough; bake until awesome. The same stand also offered hamburgers on freshly homemade buns and warm cinnamon rolls as a fine breakfast alternative for any early birds who were’t feeling the old Hardee’s across the block. And yes, of course there were fried desserts. How dare you think otherwise. My eye tends to wander down such menus till I come across items I haven’t yet tried ensconced in breading. 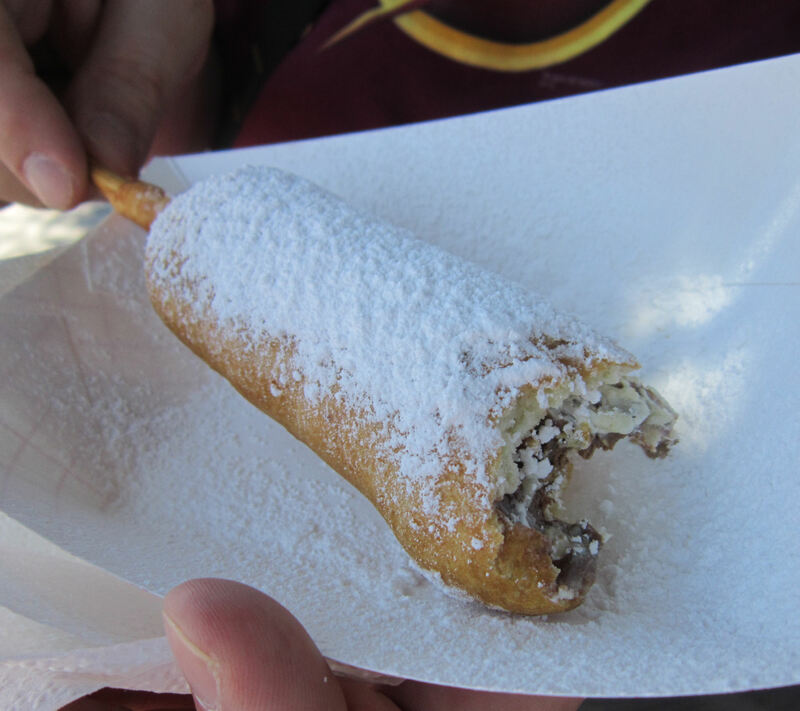 The winner in this category: deep-fried Zero bars. For those who’ve never had the pleasure, Webster’s kid brother Wikipedia defines Zero bars as “a candy bar composed of a combination of caramel, peanut and almond nougat covered with a layer of white fudge”. If you’re into deep-fried candy-aisle products, I can confirm Zero bars are a natural fit for the format. Even a major local company showed up to showcase a fancy product for the occasion. 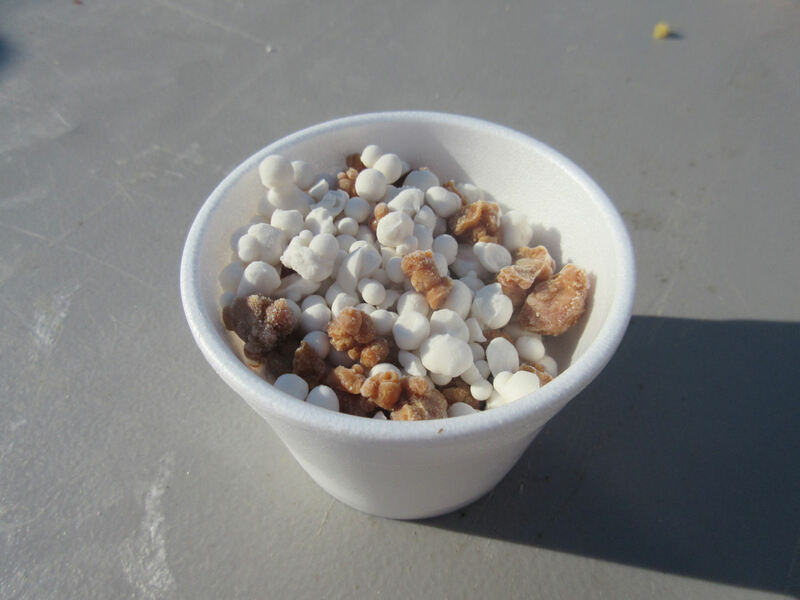 The folks at Dippin’ Dots, whose corporate HQ is across the Ohio River in Paducah, was on hand selling a variant snack called 40 Below Joe — basically Dippin’ Dots but coffee. They brew espresso (either Brazil or Guatemalan), flash-freeze it in beads, and presto! You got Adult Dippin’ Dots. Three different kinds of creamer-dots can be added — the ones pictured here are French vanilla made from coconut milk. It’s a bit strong for anyone who usually takes sugar or sweetener with their coffee, but it’s a fun attempt at something different. Possibly the most egregiously lethal food I consumed this weekend was a protein and a dessert. Behold the amazing colossal Bacon Brown Bears. 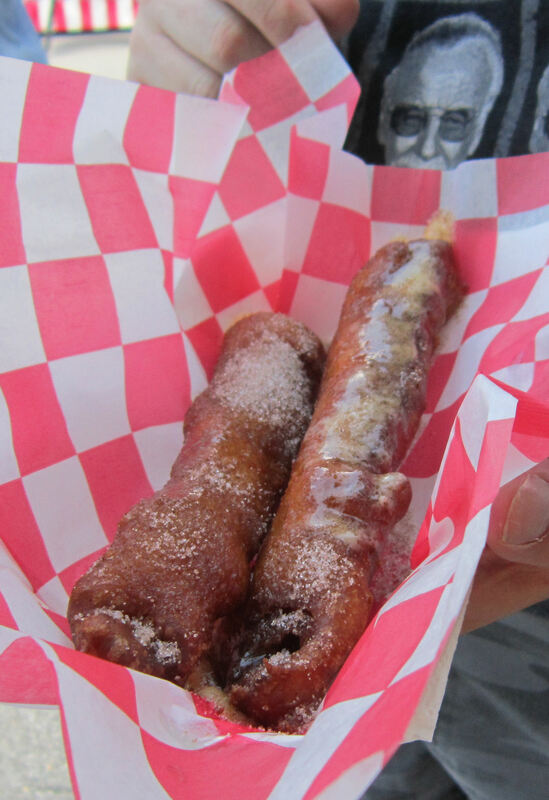 Bacon slices are dipped in several tons of batter, deep-fried for several minutes, and topped with brown sugar and rich, creamery butter. I looked upon these, and then ate them, and then almost died, and then inside I wept, for there are no more festival worlds left to conquer. Honorable mention, not pictured: while Anne enjoyed her Lemon Shake-Ups, which I normally skip, I decided to join her in fruit-filled reverie and tried my first Strawberry Shake-Up. They’re a bit heavy on the sugar, but once I got hooked…well, it’s hard to resist such a nearly narcotic temptation when you’re dancing with heatstroke in the paling sunlight. « Superman Celebration 2017 Photos, Part 2 of 4: Cosplay!